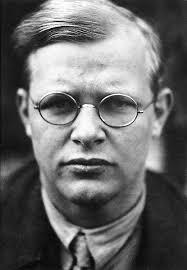 Dietrich Bonhoeffer was a Lutheran Pastor and Theologian in during the reign of Adolf Hitler. While many Pastors in his country were keeping silent, and ‘going along in order to get along’, he would not. He believed that it was the responsibility of those who knew Jesus to stand up to tyranny and oppression. In other words, when we–as Christ followers–see injustice, tyranny and evil happening in our world, it is our responsibility–as followers of Jesus–to do what we can to stop it. Not doing so is a decision we’ll have to answer for. 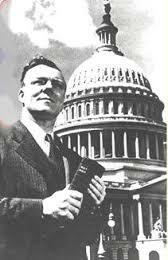 In 1947, Peter Marshall , Chaplain of the US Senate, said “If we don’t stand for something, we’ll fall for anything”. In other words, we must–especially as Christians–stand for those things which reflect the Word and heart of God. In our culture today, the teaching and values of the Word of God are being increasingly mocked and marginalized. As Jesus said, “The thief comes only to steal, kill, and destroy…” (John 10:10), and he is clearly very busy in our world! It’s almost as if our culture is daring Christians to stand up and say something. This is really nothing new, however. Back in the book of Acts, when the Church was just getting started, opposition arose. Many voices of the culture–especially the religious culture–wanted to quiet this new message–the message about Jesus of Nazareth, the risen Savior and Lord of all. Stephen, a ‘Deacon’ in the Church, was challenged. He was confronted with a choice. He could either stand up for Jesus, or try to compromise–to ‘go along’, to minimize the differences between those who worshiped Jesus and those who rejected Jesus–in order to survive. Note–this wasn’t just about some vague pressure to conform. This was a situation that threatened his very life! If he ‘made nice’, he might survive. If he stuck with Jesus as risen Savior and Lord, he may die! All this did was make his opponents more angry, so they rushed forward as one mob and took him out of the city and began to stone him, in order to silence and kill him. 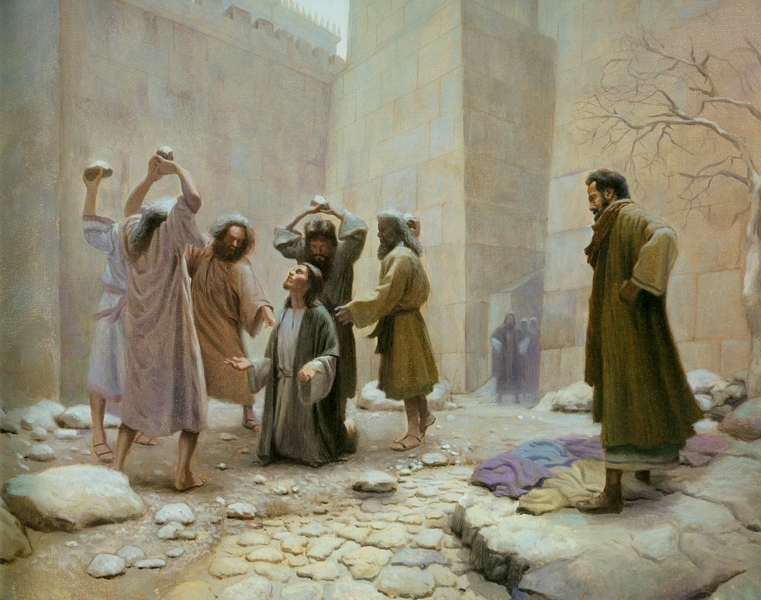 Stephen’s faith enabled him to stand against opposition. May we–all who claim to be Christ followers–have the strength to stand up against opposition, even if we have to stand alone. Bust Through! (Part 2) The Ceiling! The messages we are given by this world, by well-meaning family members or authority figures, even by fellow Christians can make it seem as though God could never do anything impactful through us. Those messages can get ingrained within us to the extent that, even when the Word of God and the Spirit of God try to tell us differently, we can’t get it. We can’t seem to ‘bust through’. It’s almost like there a plexi-glass ceiling above us…we can see beyond it, but we can’t get through it. Others try with all our might to bust through the ceiling. We try to tell ourselves ‘We’re ‘better’ than they know’, or ‘stronger‘, or ‘more special‘. In other words, we try to counter act their negatives with our own positives, hoping that that will crack the ceiling. We pound on it with determined fists…but all we get is bruised and bloody knuckles. What is the hope for us? We don’t need to ‘Crack the Ceiling’…it’s already been cracked and even obliterated! We simply need to stand by faith on the Truth of the Word of God. HE is the One who has ‘broken through’, and He is the One who can do ‘something special’ with us. HE is the only one! “For this reason I kneel before the Father, 15 from whom every family[a]in heaven and on earth derives its name. 16 I pray that out of his glorious riches he may strengthen you with power through his Spirit in your inner being, 17 so that Christ may dwell in your hearts through faith. And I pray that you, being rooted and established in love, 18 may have power, together with all the Lord’s holy people, to grasp how wide and long and high and deep is the love of Christ, 19 and to know this love that surpasses knowledge—that you may be filled to the measure of all the fullness of God. If GOD declares that we are ‘Righteous, Freed, Secure, and Empowered’, then those are the words and the truths we should believe–not the lies that the others are trying to hold us down with. God wants to take us further. He wants us to break through the limits, obstacles, and negative half-truths that we may have heard. He wants to tell us that, In Jesus, we are ‘Limitless’! Bust Through, Part 1– Listen! …too thick to push through? How do you react when you hit that wall? For many of us, we simply give up. God sometimes puts a message in our hearts… a calling. It may seem like a whisper, but it’s from Him. Sometimes God appears in big, attention-grabbing, hard-to-miss ways, and directs you accordingly. 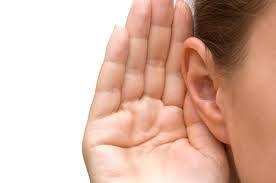 You must be listening closely, if you’re going to hear. In order to do that, we have to quiet ourselves, find a place to communicate with Him, and listen. Bring His Word along, bring–as a friend of mine says–‘something to write with, and something to write on‘–so that you can jot down things you think He might be saying to you. Pray through those things. Search the Scriptures. Check with spiritually-tuned-in, mature believers. I believe with all my heart that God wants to speak to us, TODAY. We’re simply too busy and surrounded by too much noise, to LISTEN and Hear. I think He’s looking for Listeners. He’ll communicate with them. If you’re a fan of a certain movie, the minute you read the title of this blog, you read it in a ‘certain’ way, and your mind went to the movie. The movie? The Princess Bride. As You Wish…I love you. In other words, Because I love you, I am willing to give up my own preferences, agenda, etc., and serve you. Not a bad example of ‘love’. Maybe ‘The Princess Bride’ is on to something! QUESTION: Who are those you ‘love’ in life? Do you show them by an attitude of sacrificial service–an ‘As You Wish’ mentality? Last week at Kalamazoo Community Church (www.mykcc.org), we started a series called BOLD Faith, in which we look at some people in the Scriptures who demonstrated their faith–not only in the words they said, but in a willingness to step out and follow when they were called upon by God. Last Sunday, we looked at Mary, the mother of Jesus. As a young woman who was betrothed to Joseph, and as a conservative, observant Jew, she had her life pretty well mapped out. She was making plans for the wedding and their marriage. This was major–for her family and her people (who’d been looking for and dreaming of the Messiah’s coming for centuries), but also for her! Mary knew this would be miraculous. A work of God that ONLY God could do! She had to be amazed…floored…blown away! She had to think of the cost…and it would cost her, dearly. It would definitely ‘cost’ her reputation, some friends, her standing in the community…maybe it would cost her closest friends, and even her engagement. It might even ‘cost’ her family! She believes in God, she loves God, she wants to obey God and honor Him, so she says “As You Wish“. Mary–the young woman who became the mother of Jesus–had it. Are you willing to say to God–no matter what He asks you to go through–‘As You Wish’? Are you willing to do so, not begrudgingly, but joyfully and enthusiastically, as an act of WORSHIP? I hope we all are. Sometimes God might have us go through really cool, bold things–that others will be inspired by. Other times, He may have us go through something that no one in their right mind would sign up for. Are you willing to do so? Have you ever seen a baby learn to take their first steps? No matter who you are–how strong, how ‘tough’, etc.–it melts your heart. Why would the act of watching a baby take steps–wobbly, unsure, few in number–seem like such a ‘magical’ thing? I think it’s because the innocence of that baby–the newness of what they are learning–is so pure, so simple, so ‘natural’, that it reminds us of the pure simplicity of natural growth. Growth is wonderful to see! Not long ago I had the experience of having a discussion while sitting around a campfire with my kids. In the middle of that conversation, it struck me (again): These kids are not ‘little kids’ anymore! They are young adults with lots of intelligence and deep, meaningful points to make! There, in the midst of that conversation I silently thanked the Lord (again) for blessing me with young men and women who are growing and changing, and following Him throughout their lives. When you see ‘growth’ in your kids–no matter their age–it is a great moment! I think God has that same feeling–but in a still more ‘pure and holy’ sense–when He sees His children taking steps of growth and faith. Last Sunday @ KCC, we had a service that must have brought lots of ‘smiles’ to the Heavenly Father’s ‘face’. We had almost 15 people get baptized, each giving their testimony of faith, the grace of God, and their desire to follow Him in all of their lives. Many others wrote things they were thankful for on cards and brought them to the front: Answered prayer, God’s grace and faithfulness; Blessings of family, church, etc. Accompanied by the opportunity to sing songs of praise and worship, it was a great service! Yet, I am sure that the Lord would like to ‘cheer on’ the growth of His children every day–not just at an occasional church service! As we do so–if genuine– we will also bring a ‘smile’ to God’s face. …and we just might grow in the process!